I drove down Las Vegas Boulevard. It was a Sunday afternoon. In the low sixties and cloudless. A typical Mojave sky-blue sky and a glorious day for the dead of winter's center. I was getting ready to go out and check some poles and underpasses anyway, but when an argument with my wife began to brew, I had to go–and now! Fight over what? Over what we were going to do for her 40th birthday, which was still a whole six weeks down the pike. All she wanted was go away with me on her birthday. Anywhere. Just overnight. Without the kids. That's it. That’s all. Sounded quite reasonable and easy enough, at least on paper. Now, my wife loves her children dearly and is as maternal and as nurturing as any mother; maybe more than many. We believe in quantity, not quality, time; that quality comes in its own time and you cannot jam quality into allotted time slots. However, you can also get too much of a good thing, and there's nothing wrong with the kids missing you now and again for brief, well-supervised periods. But there were major logistical complications with the planning of this particular excursion. The problem was that we had no relatives in Las Vegas, although we--mostly Maureen--had developed a surrogate family of caring friends in town over the dozen years we'd lived there with whom, in pinches, we would occasionally share child-watching duties. But her birthday, this year, was on Holy Saturday--the day before Easter Sunday. In our home the kids do an egg hunt as soon as everyone wakes up early Easter morning. Realizing what day her birthday fell on, unbeknownst to me she had long since been resigned to the fact that getting what she wanted for her birthday was not going to happen. How could we go away overnight and be home in time to ensure that the Easter bunny came and we could stage and conduct a dawn-break egg hunt? Well, unbeknownst to her, I was able to figure out a way to fulfill her birthday wish; complete with a reliable, sleep-in babysitter, and we would still be back in time to coordinate the preordained backyard ova-broadcasting activities. Save the details, she had her mind made up. It couldn’t be done. Period. But, silly me. I made the fool’s mistake of telling her of the marvelous getaway I had negotiated for us for “her day”; plans that would satisfy both her recreational and our familial spiritual and traditional needs. I cannot say whether my getting upset at her rejection of my idea was because I had been so proud that I had schemed for weeks in advance--a feat unto itself--to devise an airtight plan, or if she was irritated because she had been lamenting for months that her birthday wish could not be fulfilled and here I am detailing how it could. It likely was a combination of both. In any event, she thumbs-downed the idea out of hand. That was it. That was all. That was that. Regardless, you could just feel it coming. A fight. And it was erupting on the creamy, smooth-complected, high cheek-boned face of our "super model" relationship like a big throbbing, red-ripening zit. Well, before it got any bigger, uglier, more irritating, or headed up, I headed out to the car to take a drive and get some air. My mother always said to give those blemishes fresh air, so they could breathe and cleanse themselves. And that's just what I intended to do. So, there I was, out of the house, blowing off steam by breezing down Las Vegas Boulevard and away from town and hearth and home. The section of the boulevard I was driving down is on the far-south end of the huge, sweeping Las Vegas Valley; a landscape rarely noticed by the three-day tourists who tend to become lost farther north, within the confining walls of the casino canyons and narrow neon arroyos and beckoning beacons beaming from all directions. The side of the valley I was on couldn’t be any more distant from all that “action.” In fact, the road here loses its world-famous nickname of “The Strip” and takes on the more folksy name of “Old LA Highway,” in historical deference to its former role as the two-laner that once linked Vegas to Los Angeles before I-15 was cut through the heart of the Mojave. Old LA Highway, which is officially now Clark County Route 604, has become no more than a sometime service road to the interstate it parallels and zigzags around. With a 55-mph speed limit and being free of residential and commercial developmental impediments, this stretch of road still–although less and less--affords a rural, open, desert-highway driving experience. Perhaps Bugsy Siegel stopped somewhere along here a half-century before when he was visited by his personal, mob version of the Mormon’s angel Moroni who whispered in his ear about objects of gold--ones more bullion- than tablet-shaped--as he beheld the vast, vacant vision of the Vegas Valley before him. And, like Brigham Young did a state to the east and a century earlier, Siegel must have thought to himself, “This is the place!” It was a big gamble for both. Same pew, but a way different church. As I continued along, in the distance I noticed through the film of desert dust on my windshield a large-framed figure walking on the shoulder south amongst the cups. It was a guy with his thumb out. This stretch of blacktop is not a typical road a hitchhiker would thumb down. Maybe it once had been–back in Bugsy’s day--but with the multi-laned I-15 now running parallel to and in clear view of Old LA Highway about a half-mile to the west, anyone inclined to hitchhike would beat a path to the interstate as a first choice. And, based on the graffiti I’ve collected from its light poles, there are still a lot of folks hitching on the Vegas Valley stretch of interstate. But my innards told me that, although he had no luggage of any kind and because he was walking with his thumb out, this guy was truly attempting to get somewhere and had a legitimate need of a lift. This is a major criterion for me and, I think, for most other people whenever considering whether to give a ride to a hitchhiker: the imperfect stranger. Quickly processing his image and the associated metadata, my brain sorted them into the logical and emotional realms. This led to a gut reaction that determined a yes/no, 0/1 binary decision and literally a knee-jerk reaction that caused my foot to depress the brake pedal rather than remain on the gas. He stood a good six-foot-four, with a long ponytail, which was fed through the half-moon-shaped opening and adjustment band in his ball-cap back and flowed half way down his spine. This was counterbalanced in the front by long, bushy sideburns and a Zappaesque mustache dripping down his jowls. He wore a brightly colored, loose-fitting jogging suit, the shiny kind that makes a short, sharp, swishy shrill noise with each step. As the car slid over to the shoulder and rolled to a stop, I began gathering the ends and odds from the passenger seat for relegation to the rear. While doing so, I leaned over and flicked the lock. He opened the door and poked his head in for eye contact. With proper hitchhiker etiquette, he immediately thanked me for stopping. I “no-problemed” a return and asked where he was headed. “Jean,” was his matter-of-fact answer. About twenty miles to the south, Jean, Nevada, is an odd little place. And it is much more “a place” than it is “a town,” in the classical community sense. There are no features generally associated with town life: no schools, no parks, no village square. It does have a tiny airport, a small plastics factory, and curiously, a minimum-security state prison just up the way from a Nevada Welcome Center [Editor's note: now a highway patrol substation]. The prison sits at the ankles of the McCullough Range and is inconspicuously painted in muted, chameleon-like earth tones. But there are no houses to speak of and almost nobody lives there, aside from those serving out their sentences. 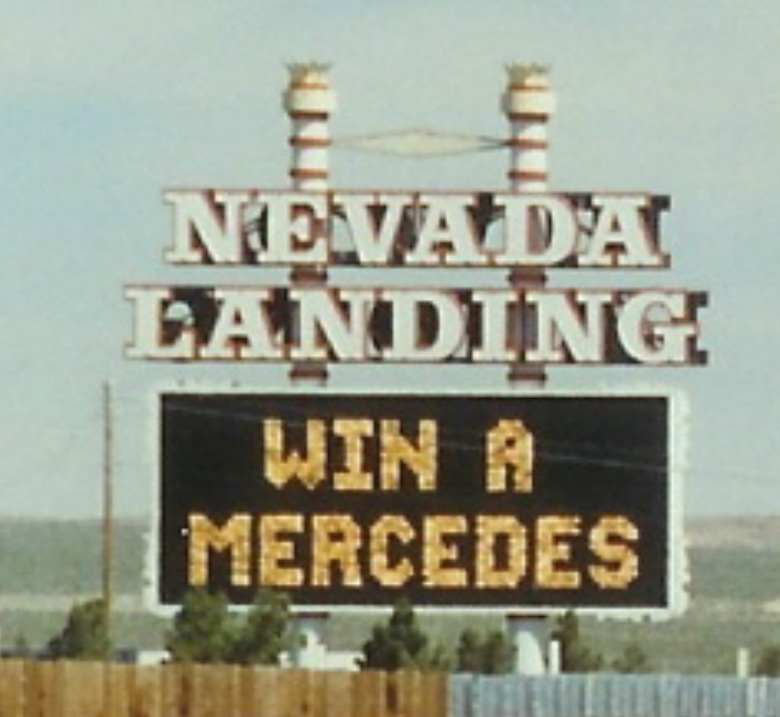 And most prominently, in a style true only to Nevada, strategically located one each on either side of its north/south interstate exits, Jean has a pair of brightly painted casinos that appear out of place for their surroundings. In contrast to everything else in Jean, the facades of these casinos jut from the Mojave's enormity like a Day-Glo tie on the belly of an obese albino in a camel hair blazer. As such, you don't really come upon Jean. And with the casinos’ electronic billboards and neon lights, day or night, the town seems to burst upon you almost without warning. So, after swiveling and contorting his large frame into the small one of my Toyota Starlet, off we two went. Once settled in, he offered gas money for the privilege of the ride. Although a proper thumbing convention if the hitcher can afford it, for me it defeats the purpose of picking up a hitchhiker. Aside from his substantial burns and `stache, he looked like he otherwise shaved his face; although, it appeared he hadn't done so for upwards of a half-dozen days. The odor emanating from his track suit could have given one the impression that he hadn't bathed for that length of time, either. I asked if he was somehow connected to those queued-up Gatorade cups, to which he informed that he had participated in the Las Vegas Marathon earlier in the day and was headed back to his pickup parked in Jean where the race began. Well, at least that sufficiently explained the cups on the road and excused the aroma escaping from under his warm-ups. Now, the very first marathon is reported to have been run in 490 BC by an Athenian, Pheidippides (various other spellings abound). He ran the plus-or-minus 26 miles from the Plains of Marathon to Athens to bring news of the Greek victory there over the imposing and formidable Persians--estimates of their 6000-plus force to less than 200 Greeks. Pheidippides, a locally renowned distance runner among a race of people even then long known for this ability, is said to have dropped dead upon completing his message-delivery mission. Pheidippides wasn't just doing it for the fun or challenge of it, nor to simply spread the good news of the Athenian trouncing of the overdog Persians. His task was to alert his fellow countrymen on the home front that those remaining Persian cats still had some lives left in them and they, having escaped by sea, were sailing Athens’ way to exact revenge on the Greek populace. With the City of Athens lying on the western shores of the Attica peninsula, which pokes out into the Aegean Sea, and the Plains of Marathon being on the east side of the peninsula, the Persians had to nose their warships around Attica's proboscidiform coastline. With the Persians sailing their way around the peninsula, the small contingent of triumphant Greeks standing on the Plains of Marathon didn't need Euclid to express in geometric terms that the closest distance between two points was to beeline it overland. So, Pheidippides hypoteneused it across the plains to deliver the “I’ve got good news and bad news” shtick. The good news being “we kick their butts...,” and the bad, “...in the direction of Athens.” The good news for Greece was also that to pass the word Pheidippides had run the marathon in both Olympic- and world-record time, the bad news for Pheidippides was that, in the process, he did his final torch or baton pass. Upon arrival, all he could muster was a mutter of the word, “Nenikekamen!” which translates as, “Victory is ours!” Evidently, this was enough of a sound byte to be carried on through the eons and loosely translated into, “We just did it!” There's no coincidence, either, that Nike happens to be the ancient Greek goddess of victory. With respect to Pheidippides and his expiration, it gives a different spin on the Nike slogan, “Just do it,” don't it? It seems this Greek hero could have done with one or two of those cups of Gatorade to electrolyte his path like my passenger and his striding cohorts had access to that morning lined up on Old LA Highway some two-and-a-half millennia later on a run honoring this celebrated feat of endurance. And after it all, it turns out that Pheidippides gets not a drink, nor a race, nor a running shoe named after him. Perhaps his name is too hard to spell or pronounce? However, although those ancient Persians did quite well for themselves for sometime to come after their defeat on the Plains of Marathon, they never could best those pesky Greeks whose civilization was, at the time, on the cusp of its own long run at ancient grandeur. It is kind of ironic that Persia is, today, called, ahem, “I-ran.” Maybe that is how Pheidippides ultimately was honored! I saw a Dead Head sticker on a Cadillac. I did ask where he was from and what he did besides run. His name was Brent and he was from Utah and he revealed himself as something of a Renaissance man, certainly for someone who lived in a state that, speaking of ancient history, some consider as having its wagon wheels mired in the mud on the dirt road somewhere between the Dark and Middle Ages. He was a parole officer in a small town near Ogden, where he claimed he was looked at with great suspicion because of his hairstyle. I suspect he, in part, wore it that way not only because he liked to, but also as a counter-cultural statement by letting his “freak flag fly.” He claimed he was supposed to be in court on Monday--because of work, not “play”--but had the date postponed so he could go rock hunting somewhere around Bryce National Park. As we came into Jean, he noticed the state prison up the hill and proceeded to ask about it--professional curiosity or busman's holiday, I surmised. A mile or two miles south of Jean, the Nevada section of Old LA Highway ended at the small airport, as did the ride. Brent’s pickup truck was parked off to the side by a skydiving viewing area. As the car stopped he turned toward me as best as he could maneuver and held out his hand to thank me. “My pleasure. Name's Mark," I said, as we shook hands. “Brent...take care,” he responded as he exited and headed on his own way. That's the way it is with hitchhiking, most times. From strangers to traveling partner to life stories to never seeing you again. All in a flash. All with some kind of edge. While one-eightying it on the gravelly graded desert hardpan and readying to get back on my way, I noticed a few people near the parking lot looking to the sky. Tracking down the objects of their attention, my line of sight joined theirs in watching two parachutists gliding to the flat, dusty ground. How ironic, I thought. I had taken my first--and to date, only--jump little more than a year before, on my 40th birthday. This led me back to thinking of Maureen's upcoming birthday, something that had slipped from my consciousness during the ride. And it occurred to me that I was feeling like I wasn't upset anymore; that I must have gotten enough of that refreshing air I had sought upon leaving the house. Also ironically, that mentally cleansing air was in a physically confined space filled with the musky, malodor of a marinating marathoner. When I was finally done with my graffiti investigating that afternoon, I hopped onto I-15 north, instead of using Old LA Highway, and headed home. So, there I am minding my own business doing 70-plus with the radio on when I look over into the lane next to mine and notice some friends, Mike and Diane, riding in a car beside me out for a Sunday drive. They are old neighbors that moved away, but with whom we still kept in occasional touch. Getting off the same exit, I pulled onto the shoulder with them behind me. I got out and went back to chat. After we obliged each other with the how long it had been since we’d gotten together and how we'd been consumed with kids and jobs and this and that, Diane proceeded to ask if Maureen had had her 40th birthday yet! Sheepishly, I told her no, but that it was coming up and we were working on it. The fact was, I knew more about what I didn’t know about it than what I did know. We said our good-byes and I drove home smiling, having completed something of my own little emotional marathon. But, unlike Brent’s race that morning and Pheidippedes’ run millennia past, mine ended right where it began.